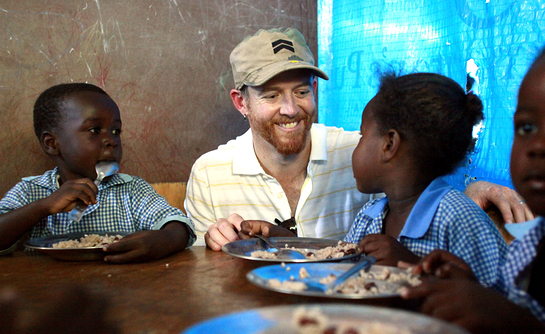 Dave “Phoenix” Farrell, a member of the two-time Grammy winning, multiplatinum band Linkin Park, returned from a trip to Haiti yesterday with the United Nations Foundation to see firsthand how the United Nations is helping Haiti rebuild, fifteen months after a major earthquake killed hundreds of thousands and destroyed much of the nation’s infrastructure. Dave "Phoenix" Farrell, right, and Peter Yeo, UN Foundation vice-president for Public Policy. Among the many hardships facing Haitian women is the threat of sexual violence and intimidation. While in Haiti, Phoenix met with UN staff and Haitians to learn how something as simple as solar street lights are protecting women and children from violence at night in the camps, and how their charity Music for Relief has already helped to protect thousands. Over the past months, 200 cost-efficient, environmentally friendly and durable LED streetlights have been installed by the UN’s Population Fund with the guidance of Haitian women. The lamps, provided with support from the UN Foundation, Music for Relief, and USAID, are already leading to a reduction of violent incidents. In addition, regular patrols by the United Nations Stabilization Mission in Haiti (MINUSTAH) and the Haitian police are helping to reign in crime. Music fans are encouraged to Download to Donate (or text “RELIEF” to 90999) and make a $10 donation as part of Linkin Park’s charity Music for Relief. In return, supporters gain access to a digital album featuring unreleased tracks by a growing number of artists, including Alanis Morissette, Glitch Mob, Crystal Method, Slash, and the original song by Linkin Park, Not Alone. Since it’s inauguration in 2005, the charity has raised more than $3.9 million for victims of natural disasters around the world, including Hurricane Katrina, monsoon flooding in Pakistan, and the tsunami in Japan. Since the earthquake, Download to Donate for Haiti has raised more than $270,000 supporting the work of five organizations in Haiti including the UN Foundation.